The very best hand picked, immaculate shells from otheir most experienced carvers across West Africa. Skinned & finished in Melbourne, to the highest standards on the market. Only the best hardwood shells from the best carvers make this grade. The symmetrical shells consist of 90% heartwood or more, the tonal range and quality of the shells are outstanding. Each hide is carefully balanced to suit the dynamics of each drum to maximise its voice. 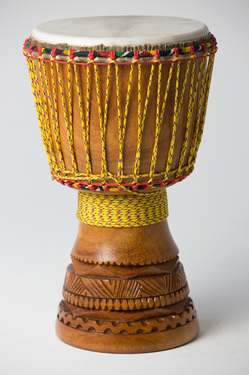 Each djembe looks as good as it sounds too with additional time invested in sanding and oiling or lacquering the shell. There are plenty of outstanding soloist drums in this range and rich accompaniment drums too. You’ll find drums from Guinea, Mali, Burkina Faso and the Ivory Coast here, and a wide range of hardwoods available including Khadi, Lenke, Dugarra, Numu and Djala.